Oil & gas in the Caspian has a long history - indeed it is one of the earliest oil production regions in the world, with Baku a major oil center in the second half of the 19th century and beyond. What makes the situation today interesting is the simultaneuous appearence of three things: (i) new reserves disovered offshore, (ii) the fact that, with the break up of the Soviet Union, the oil is located in (new) countries that are keen to have foreign investment and (iii) these countries have no direct access to the world markets, the Caspain Sea being a closed sea. - the gas production in the region developped under Soviet times, and also connected to Russia by (gas) pipelines. This concerns mostly Turkmenistan and Uzbekistan. That gas is almost exclusively produced by the national company, and also sold to (or through) Russia on the basis of bilateral governmental agreements. In the absence of the new sector (below) like for oil, Russia has absolute power over these countries and their gas production, because they have absolutely no other choice. They would like to have other pipelines to export their production (for instance going South to India or Pakistan via Afghanistan), and some people seem to tell them that this would be possible, but IT IS NOT. I have written about this elsewhere, and will do so again in the comments if requested, but you need just remember one thing: the mooted pipelines through Afghanistan would be gas pipelines, not oil and they have no chance to being built for a very long time because nobody will pay for them. - the third and most interesting sector is the new investments being made by Western Oil Majors to develop recently discovered fields, mostly in the oil sector. This is where most of our attention will focus, because that's what most of the diplomacy of the past 15 years has been concerned about, with two main topics (i) how to make the investments to develop production, and (ii) how to get the hydrocarbons to the market once produced. It is this new sector that has created the hype around the Caspian and its new reserves, because it is one of the few areas in the world where big fields have been discovered in recent years. The excitement in big oil companies is real, because the province is probably the size on the North Sea AND it is accessible to them. Being the size of the North Sea only, it will not change the oil balance of the world either - it will account at most for 3-5% of world production at its peak, in 5 to 10 years. That's the big oil field just offshore of Baku in the Azerbaijan sector of the Caspain Sea. It is currently the only field in Azerbaijan with proven oil reserves, despite massive exploration campaigns in the past 10 years. It is currently being developed by a Western consortium led by BP (which includes Unocal, Devon, Amerada-Hess and ExxonMobil of the USA as well as a number of other companies), under a contract signed in 1994 (and which is public, you can download it here, along with a ton of other documents on the project). It has an estimated 5 to 7 billion barrels of recoverable oil (slightly less than what is hoped to be found in ANWR, to give you an idea). It has been producing small volumes, about 100 to 150,000 b/d, since 1998, which are exported by a small pipeline going to Georgia, the Baku-Supsa. (They also have the right to use the Baku-Novorossisk pipeline going through Russia, see the maps below). Big investment is underway to bring production to between 800,000 and 1,000,000 b/d in the next couple of years. Whan I say big investment, I mean big: about 12 billion dollars will have been spent by 2010. Most of that oil will use a new pipeline, the BTC (see below) which is currently being built. (2) Shah-Deniz. It's a big mostly gas field offshore Azerbaijan. It is actually the only significant discovery of hydrocarbons in the Azeri sector, but it is gas, which was not the best of news for the oil companies, as the markets are very, very far away. The consortium is also led by BP (with Total, Statoil of Norway, TPAO of Turkey and OIEC of Iran) and it has managed to go ahead with the development of the project by signing a contract for the gas with Turkey (although there are doubts about Turkey's need for that gas). BP has agreed to build a gas pipeline in parallel to the BTC oil pipeline to bring the gas to Turkey, and they are now hoping to build new pipelines form Turkey to central Europe to be able to give more value to that gas. That project is still in its early phase, but you can find more details by clicking on this link which refers to its codename: Nabucco (pdf, 280 kb), which includes this map:. A big onshore oil field in Kazakhstan - one of the biggest in the world, developped by a consortium led by ChevronTexaco (and including ExxonMobil, Lukoil and ENI of Italy), with about 9 billion barrels of recoverable reserves (another ANWR). Although Chevron came in in 1993, they have had a really hard time with that field, as they had no way to export the oil anywhere. They have used amazing ingenuity to sell their oil (including owning most of the railcars of the former Soviet Union - about 9,000, to sell their crude by rail, or sending barges all the way to Finland by the canals of Russia) but this has seriously limited the production of the field. 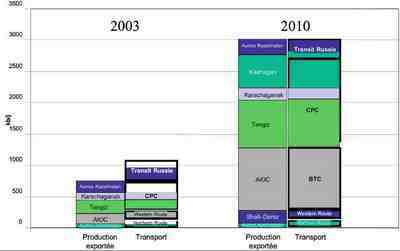 Now that the CPC pipeline has finally been built (see below), they are finally ramping up production, which is expected to reach 700,000 b/d in a few years. The biggest oil field to be discovered in the past 30 years, it is in the North of the Caspian Sea, in the Kazakh sector (see a detailed map here), and it is being developped by a consortium including all the big majors (ExxonMobil, Shell, Total, ConocoPhillips, ENI, BG and Inpex, with ENI, the Italian group, as the operator (Exxon did not want Shell, Shell did not want Exxon, and ENI was smarter than Total to be voted in...). With 9-15 billion barrels of reserves (exploration is not totally complete), it is yet at least another ANWR fully in control of BigOil, but it is very challenging technically (very high pressures, located in an areas which is at times seawater, ice, mud or any combination in between, and far away from any transport infrastructure in an area with a very tough climate) and it will need to find export routes for its production (a combination of CPC and BTC is likely to start with). A big, mostly gas field in North Kazakhstan near the border with Russia, it is being developped by ENI, BG, ChevronTexaco and Lukoil. As a gas field, it is heavily dependent on Russian gas monopoly Gazprom (the gas is currently being processed at the nearby Orenburg Gazprom plant), but the consortium is strong enough to negotiate decent terms and to build its own infrasturcture. As the field contains both gas and liquids (i.e. good quality oil) which have to be produced together, the consortium has focused on selling the oil on the world markets and selling the gas at a low price to Gazprom. The oil will go into the CPC pipeline. So this bring us to the pipelines. There are a number of existing ones, most of which go through Russia and are thus considered by the oil majors - with reason - as unreliable. They have thus made a lot of efforts to find new routes. A simple solution would have been to ship oil to northern Iran (where Iran's refineries are) and swap it for Iranian oil produced in the south of the country. This made good sense for Iran, which would not have needed to ship its own oil for the production in the south to its refineries in the north, but it is not possible under the current US sanctions regime (ILSA). This solution would be partial anyway as the capacity of the Iranian refineries is no more than 800,000 b/d and they would have needed significant investment to ba able to use the Caspian crude qualities. So with Russia and Iran out, this left only the Western (and at a later point Easter to China) routes. An additional problem is that of the Bosphorus, which already sees a significant volume of oil tanker traffic, which the Turkish authorities were keen to not see increase. 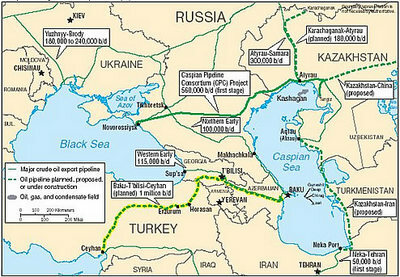 Bringing in an additional million barrel per day or two into the Black Sea (on the coast of Georgia for instance) would have created a real danger for Istanbul and this was thus stronly opposed. You can find a massive quantity of information on the project starting from here, but the main thing to know is that it will have a capacity of 1,000,000 b/d, a good chunk of which will be used by ACG oil to start with, and all the liquids Shah-Deniz can produce. It is currently being built and is expected to come into service by the end of this year. It has cost 3-3.5 billion dollars to build, more than half of which was financed by international banks with the participation of the World Bank and the EBRD. 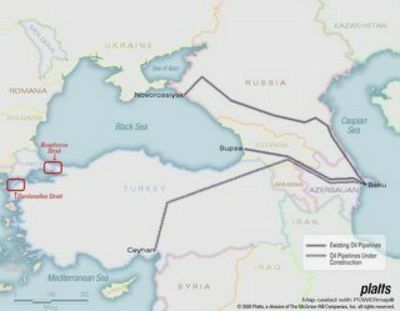 The other big pipeline in the region is the CPC (Caspian Pipeline Consortium) which, as you can see on the maps above, does go through Russia and does bring oil into the Black Sea. It nevertheless has the particularity of being the only privately owned pipeline on the territory of Russia (something that they really don't like and are trying to undermine at every turn, especially these days as an extension is being discussed). It was built (and paid for) by a consortium led by ChevronTexaco, and currently has a capacity of 450,000 b/d, due to be increased to 1,300,000 b/d. It is used for oil from Tengiz and soon from Karachaganak. So, what can be learnt from that? - Big Oil fully controls the operations of the 5 major oil fields, so the region clearly falls in the sphere of influence of the "West". The two producing countries have made an explicit decision to welcome foreign investment and will be richly rewarded for it. The revenues is split using a standard instrument, the PSA (production sharing agreement), which allocates the oil produced first to repay the initial investments ("cost oil") and then as profit ("profit oil"). Host countries get a growing share of the oil as the fields produce and as prices go up. The marginal split usually gives more than 90% to the host country. - Oil transit is also pretty much solved, with the CPC in service and the BTC about to be. These two pipelines will bring significant new volumes of oil into the Mediterranean oil markets and are enough to transport the expected oil volumes from the existing fields. Oil majors have been smart enough to lead in parallel the investments in the upstream (production) and midstream (transport) and have thus been able to ramp up the production of their fields as fast as was possible under the circumstances (it still took time - more than 10 years for both ACG and Tengiz, with the same expected for Kashagan). - the Caspian oil will go entirely West for the next 10 years, but it is likely that the next route will go east to China. China is making a lot of efforts, especially in Kazakhstan, to procure some oil, but with uneven results. They have tried to buy out BG's stake in Kashagan, but the other shareholders exercised their preemption rights despite strong Chinese pressure (they even threatened to kick Shell our of the Chinese refining business, to no avail). Nevertheless, there is a strong strategic rationale for it to happen eventually. - please, please be wary of what you read on this topic. Too many people have other interests that you may not be familiar with and their public announcements should be taken with a grain of salt; don't believe that everything which is announced will happen; don't even believe that everything signed will happen. It's not because Halliburton is involved that it is necessarilty a big plan to scam us off (KBR, the Halliburton subsidiary, is one of the biggest contractors for big oil projects, and one of a few to be in the competition. Please remember that they are paid by Exxon or ChevronTexaco and thus will not scam them like they seem to be able to do with the US government). - finally: don't forget that people are going to these God-forsaken places to get the oil that YOU will be burning today, tomorrow and again. Before blaming them for providing a valuable service, remember that they are providing that service ultimately to YOU. There is a lot more to write on the topic; I am not avoiding any subject and would be pleased to provide more info in the comments at your request. Jérôme à Paris: thank you. i don't write my thanks frequently enough for the excellent education you provide... many, many thanks. the caspian oil is light or heavy? @giap; what wars will we fight when the oil burns out? Great post Jerome. Its always great to get into the oil and gas field since it has made headlines so much lately. I have questions. How much natural gas is in the Caspian area? What is the status of the area in Siberia that China and Japan are fighting over to develop? There is oil and gas there that is untapped. Just a few follow ups. jdp - most of the gas in the region is in Central Asia (Turkmenistan and Uzbekistan). Turkmenistan has the 4th largest reserves in the world (after Russia, Iran, Qatar), so a lot. re Siberia - the oil is unquestionalby inside Russia. What Japan and China are fighting about is the final destination of the pipeline from these fields (just West of Lake Baikal) - direct to China or to the Pacific coast of Russia. That last option, favored by the Japanese, seems for the time being to have won, but, if confirmed, that means that China will have access to the oil as well, by tankers - but they won't have exclusive access as with a pipe. WASHINGTON (MarketWatch) -- A handful of former high ranking U.S. officials sent a letter to President Bush on Monday calling for a reduction in U.S. dependence on foreign oil. A top concern is the possibility of terrorist attacks on oil and natural gas pipelines in the Middle East that could reduce world supplies, James Woolsey, former director of the Central Intelligence Agency, said during a conference call. The officials, who served under presidents Reagan, George H.W. Bush, and Clinton, called on the administration to spend up to $1 billion over the next five years to establish a domestic alternative fuels industry. "It just takes a little political will," said C. Boyden Gray, former White House counsel to President George H.W. Bush. http://www.truthout.org/issues_05/032805EA.shtml>meanwhile in Africa: oil, politics, money, Men With Guns. The Long Emergency is going to be a tremendous trauma for the human race. We will not believe that this is happening to us, that 200 years of modernity can be brought to its knees by a world-wide power shortage. The survivors will have to cultivate a religion of hope -- that is, a deep and comprehensive belief that humanity is worth carrying on. If there is any positive side to stark changes coming our way, it may be in the benefits of close communal relations, of having to really work intimately (and physically) with our neighbors, to be part of an enterprise that really matters and to be fully engaged in meaningful social enactments instead of being merely entertained to avoid boredom. Years from now, when we hear singing at all, we will hear ourselves, and we will sing with our whole hearts. This was an excellent piece, Jerome. Many thanks. The one thing that strikes me is how relatively small these fields are. By that, I mean that while they may add incrementally to world supply, they won't change the balance of supply either individually or together. Too, the difficulty in finding these fields in areas that have been fairly heavily prospected indicates to me that it is unlikely that many new major fields are out there in Central Asia. The US seems to have a lot riding on Central Asia as a source of supply. None of the Central Asian dictators are especially savory characters, but the US has embraced them (especially Karimov) pretty much wholeheartedly. Is this going to give us (the US -- sometimes I forget everybody isn't American) the same sort of profile in Central Asia that supporting the Saudis has given the US in the Middle East? Too, it looks like getting any oil from the east side of the Caspian (i.e., from Kazakhstan, Turkmenistan or Uzbekistan) is going to rely on pretty complicated infrastructure that I assume could be sabotaged relatively easily. Am I getting too paranoid? "Suburbia will come to be regarded as the greatest misallocation of resources in the history of the world"
Indeed, if you except war, that is. "Small towns and smaller cities have better prospects than the big cities, which will probably have to contract substantially"
Just what happened to Rome and then Byzantium. They grew crop inside the city's walls after population was reduced, thanks to cut supply lines from overseas provinces. Great column, even though it's clearly biased ;) us Europeans can't enjoy any "cheap oil", we pay through the nose and thus we are not allowed to indulge in the ideological nitpicking so typically yankee (Iran bad, Turkey good, etc). You can't always use oil as a compass, or you will have to justify illegal wars waged because the local regimes were becoming "unreliable"... this said, a better long-term global policy would be to use this as an occasion to restructure an important part of the ruined Russian economy, but it won't happen. Do you really think all those smallish countries full of protoislamic potheads will be more reliable, in the long run, than Russia? And what if they turn in another Chechnya? How do the LNG terminals fit into this? This is nice article.there should be more informaiton regarding the history of caspian region.